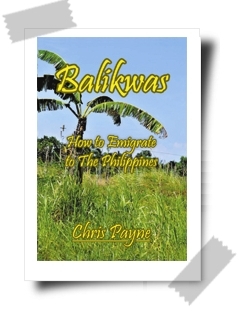 ‘Balikwas’ is a Tagalog word, virtually untranslatable to English. It signifies a startling change, such as an awakening. It can also mean ‘going over to the other side’. Chris Payne writes about making a change, a change moving his life to the other side the world when he and wife Loydz emigrated to The Philippines. The book is an account of what needed to be done at each end of the ‘project’, as they came to call it, but it also includes amusing asides about like and its quirks. It can be read as a simple ‘how to do it’ guide for anyone contemplating emigration, either to The Philippines or elsewhere. Or it could be sees as a comic account. Most of all though, it is an encouraging and life-affirming story of how, even late in life, one can still change one’s life and enjoy new and interesting experiences in a far away country.